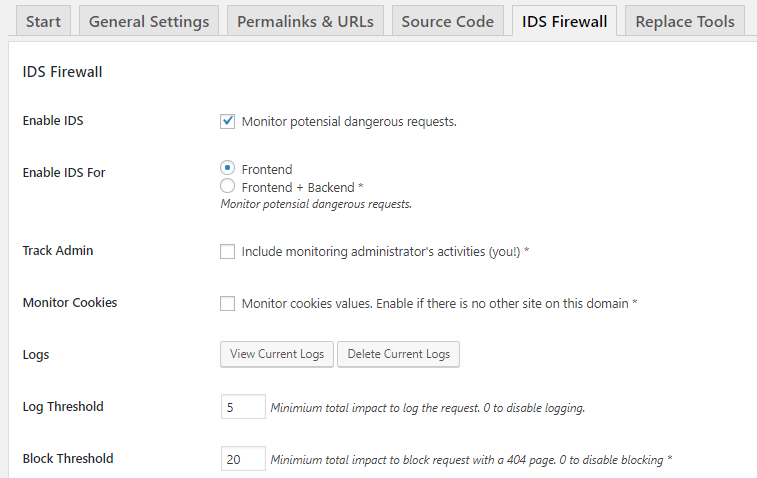 Enable IDS (Intrusion Detection System) option to monitor the requests coming to your site and block the malicious request. You can opt to monitor administrator’s activities and cookies values. You can view the IDS logs or delete the logs from this section. Enter here the minimum total impact value to log the request. The recommended value is 5. Enter 0 to disable logging. Enter here the minimium total impact value to block the requests with a 404 page. The recommended value is 20. Enter here the minimum total impact value to notify you about the request via email. The notification will be sent to site admin. The recommended value is 30. Enter 0 to disable notification. Enter here the fields (request names) that will be excluded from IDS. Enter one field per line. Enable this option to connect to trust network, fetch known dangerous IPs and patterns and ban them. If enabled, it’ll whitelist Scan My WP API server to scan your website. Do not enable if you don’t use this plugin. Note: Do not enter your own IP for testing purpose. Enter here the message to be displayed when blocked IPs or countries visits your site. Enter here the country codes to be blocked from accessing your site. Separate multiple country codes with comma “,”. Use ISO-2 code list.